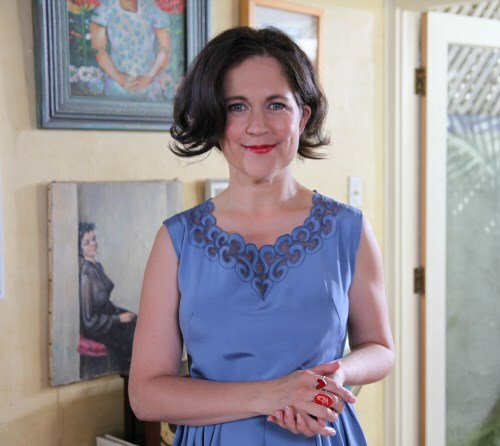 In Annabel Crabb’s accidental second career as the host of political cooking show Kitchen Cabinet, she negotiates her way into the homes of Australian politicians, bringing dessert - the internationally recognised culinary code for ‘I come in peace’. But food is a language that says so much more than ‘Please let me in, Madam Speaker’. To friends and family, food can say everything from ‘I’m sorry you had a bad day’ to ‘Congratulations, you clever thing’. And it means still more when brought to the door. Now, in Special Delivery, Annabel has teamed up with her best friend from childhood, fellow food tragic and Kitchen Cabinet recipe consultant Wendy Sharpe, to bring you recipes for those knockout desserts as well as tons more ideas for soups, salads, pastries, breads and other treats ideally suited to make and take to those you love. Each recipe is offered up with transport instructions or an implicit promise. Wendy Sharpe is Annabel's oldest friend from preschool days. She and Annabel have delivered countless meals and edible care packages to each others' houses when living in any of three common cities over the years. Wendy is a recipe consultant on Kitchen Cabinet, fellow baking tragic and mother of three. She lives in London. A delightful book to read with many good and practical recipes that I would use. The wonderful social connection of sharing a meal. Great range of easy to follow recipes, made even better with specific advice for transporting and sharing your gastronomic delight with friends. Looking at a fairy cakes recipe in the special delivery book. Firstly it doesn't say how many hole mini muffin tin 12 or 24? Nor does it say how many it makes- so leaves me pretty clueless as I was planning to do it on my daughters birthday. I guess if I am really keen I will have to see how many of the holes it fills of my 24 hole mini muffin tin- disappointed these are basic things every good recipe book from women's weekly would not miss out. Beautiful yet useful cook book! This cook book has a great idea behind it - food you can prepare to take to others for various reasons such as your friend is sick or you want to take something different to a BBQ. DOn't be put off by the fact recipes are vegetarian plus fish only. Many recipes can easily have chicken or bacon added. Great recipes with entertaining introductions! I love this cookbook, not least because I love Annabel Crabb and the recipes are introduced with her usual witty prose - some are recipes that she used on Kitchen Cabinet and relevant anecdotes are shared. The premise of food that one can take to another location is a unique and lovely one - there are great tips on how to transport each one. And the recipes in general don't disappoint - I've had a couple of underwhelming outcomes but despite only owning for six months there are several recipes I have made multiple times and they are now part of the regular go-to repertoire. Special mention to the Cloud Cake and the Persian Love Cake in the dessert section - which is about half of the book! Lovely looking book with a retro feel in both photos and recipes. Loved the accompanying stories with recipes. Also loved that the recipes are specifically portable! Real recipes that work because they are the authors' own. Recipes ideal for busy people- deliciously nostalgic. I've used this cookbook a lot and all the recipes work very well. Great for family dinners and the commentary is often very funny. A pleasure to read. Annabel Crabb is one of Australia’s most popular political commentators, a Walkley-awarded writer, and the host of Australia’s first dedicated political cooking show, ABC TV’s Kitchen Cabinet. She writes for ABC Online’s The Drum and has worked extensively in TV and radio. She is a columnist for the Sunday Age, Sun-Herald and Canberra’s Sunday Times, and has worked as a political correspondent and sketchwriter for titles including the Advertiser, the Age and the Sydney Morning Herald, and as London correspondent for Fairfax’s Sunday papers. She won a Walkley Award for her 2009 essay on Malcolm Turnbull, and was Australia’s 2011 Eisenhower Fellow. Annabel is an enthusiastic social media user and tweets about politics and food as @annabelcrabb. She lives in Sydney with her partner, Jeremy, and their three children.